This paper proposes a new measure for ensemble pruning via directed hill climbing, dubbed Uncertainty Weighted Accuracy (UWA), which takes into account the uncertainty of the decision of the current ensemble. Empirical results on 30 data sets show that using the proposed measure to prune a heterogeneous ensemble leads to significantly better accuracy results compared to state-of-the-art measures and other baseline methods, while keeping only a small fraction of the original models. Besides the evaluation measure, the paper also studies two other parameters of directed hill climbing ensemble pruning methods, the search direction and the evaluation dataset, with interesting conclusions on appropriate values. Asuncion, A., & Newman, D. (2007). 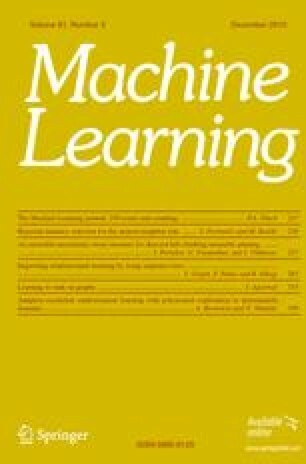 UCI machine learning repository. http://www.ics.uci.edu/~mlearn/MLRepository.html.